Loved by gardeners and cut flower admirers for their large, showy flowers in late spring to early summer, peonies (Paeonia spp.) include both herbaceous and shrub or tree types that develop woody stems. The 30 or so different peony species grow in meadows, scrubs and rockeries in Europe, eastern and central Asia and western North America. Generally, all peonies are long-lived plants and resent any disturbance to their roots. Grow them where winters are pronounced and cool or cold: USDA hardiness zones 3 through 8. Native to temperate regions of the Northern Hemisphere, peonies must undergo an annual dormancy during the winter. Without this "rest," the plants' vigor and flowering ability is extinguished or greatly diminished. Depending on species, peonies generally survive a winter dormancy where low temperatures range from minus 40 to plus 20 degrees F. Tree peonies cannot retain their above-ground woody stems when temperatures get below minus 20. Overall, peonies grow well in regions with short to fairly long, hot summers, but it varies according to species. Some species native to eastern Asia perform best only when garden conditions mimic their native habitats in soil and climate (both winter and summer temps and rainfall). Herbaceous and tree peonies generally grow well where summer temperatures reach above 86 degrees F no more than 120 days annually. This correlates to the American Horticultural Society's heat zones 8 through 1. Peonies appreciate abundant sunshine. Plant them in a garden setting where they receive at least six hours of direct sun daily. In cool summer regions, peonies grow well and do not prematurely brown their leaves and thus can take more than eight to 10 hours of direct summer sun rays each day. In hot summer areas, consider planting peonies where trees provide some cooling dappled shade in the afternoon. 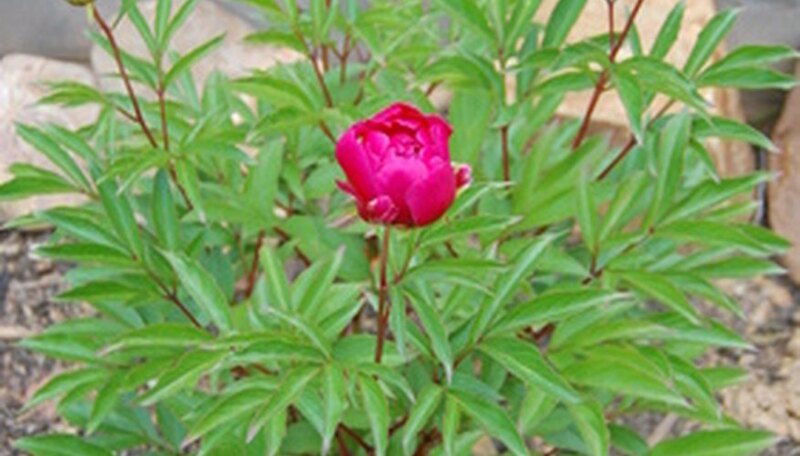 Peonies can grow in partially shaded spots, but flowering may be diminished or growth rate and vigor may be less compared to those in sunnier garden beds. Grow peonies in a fertile garden soil that is rich in humus or other organic matter like compost or well-rotted manure. The soil should be deep, fertile and crumbly to a depth of at least 12 inches, or planted on topsoil and fertile subsoil layers that extend downward to at least 18 to 24 inches. The soil must be consistently moist but well-draining. Peonies are best grown sheltered from strong winds during the growing season. The large flower heads are heavy and stems often snap or bend over to the ground in winds or after repeated pummeling from heavy rains. Staking tree peonies for adding strength in an area protected by a hedge or fence reduces chances for breakage. Herbaceous peonies can have a wire cage or nylon net placed above the emerging shoots in spring. The stems grow through the grate openings at a height of 18 inches and are supported as they continue to elongate and then support the large flower heads. Transplant peonies after they complete flowering and then best in very late summer or early autumn. Tree peonies' graft union need to be planted 5 to 6 inches below the soil while herbaceous peonies' "eyes" (or new growth tips) on the roots are no deeper than 2 inches below the top of the soil. Planting herbaceous peonies too deeply is a common reason the plants fail to produce flowers when all other growing conditions in the garden are favorable.